That is the biggest request you guys have for Mailbird. And we’re on it. Our developers are pounding away at their keyboards even as I write this, and we will unroll multi-account in about a month. But there’s this little feature called multi-identities that might just solve all your multi-account problems right now. Think of it like multi-account beta. At it’s most basic, multi-identities is a feature that lets you send an email from any email address you want. So, when you’ve got to talk about that last meeting with your teammate, you write your email and then click “Send from [email protected]”. When planning your weekend adventures with the crew, you click “Send from [email protected]”. Doesn’t sound like much at first glance right? But here’s what it can do. With a little bit of filtering & forwarding magic, multi-identities lets you centralize all of your inboxes into one, and manage your emails just like you would with multi-accounts. The set-up for multi-identities takes longer than it will for multi-accounts, which is one of the main reasons we’re building multi-accounts. It’s about 2-3 minutes per email account. 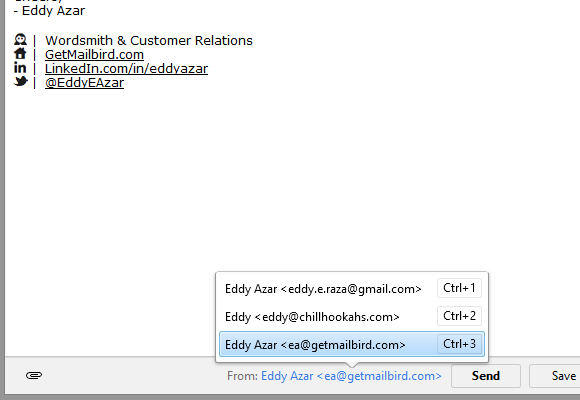 First, in Mailbird, click ‘Mailbird’, ‘Options’, & ‘Identities’. Then click that little ‘+’ sign & fill out the information to add a new account. You can even give each email it’s own signature. You can give each address it’s own signature. And, if that signature includes HTML (like mine does) all you have to do is copy paste it’s visual format into the text box and it’s ready to go. To use it, just click that little “From: [email protected]” area at the bottom of every compose & reply box, and choose which email you want to send it from. Now the slightly more advanced stuff. The steps that turn multi-identities into a multi-account equivalent. 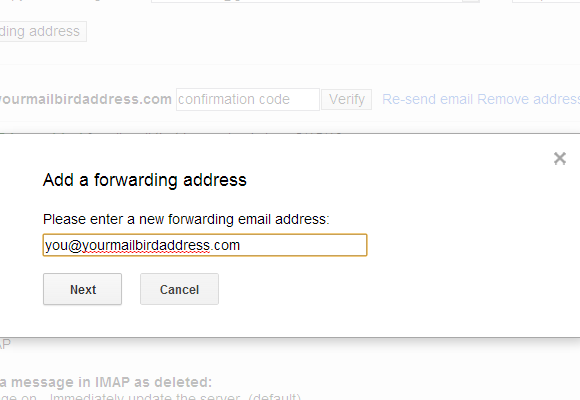 First, go to your other email accounts & set up forwarding so that all incoming mail to that email account get’s automatically forwarded to the gmail account you’re using in Mailbird. If you’re not sure how to do it for your email, google knows. The final, and optional, step to a centralized inbox: go to the gmail account you’re using with Mailbird & set up filters to organize incoming emails into their own tags according to which emails they were sent to. You can do this by sorting via the “To” field.  You now have a centralized inbox for all your emails, a way to sort them according to where they’re coming from, and the ability to reply & send from any email you want. In short, you have all the capabilities of multi-account, a month before multi-account goes live. 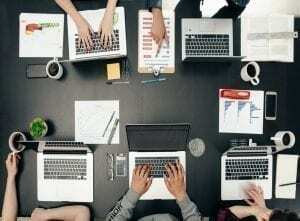 59 thoughts on "Multi-Account vs. Multi-Identities"
Great Article! Great Functionality! 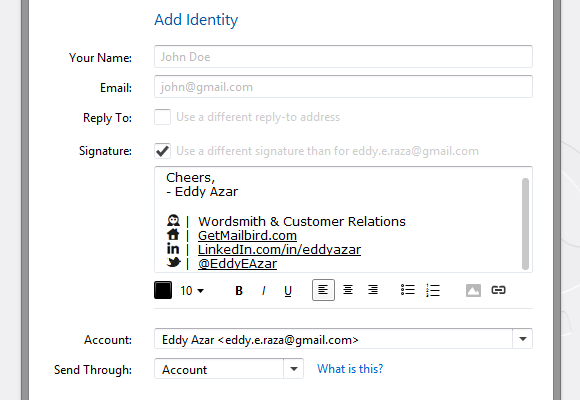 Multi-Identities Rock in Mailbird! IMAP to external accounts, or POP3 only? This feature is the primary reason I use Mailbird. Thanks for realizing that lots of people use it. Does Mailbird Pro only supports Gmail/Google Apps too? For the moment. We’re working on bringing support for the other major email clients right now, and it’ll be ready to go in about 2 months. Does Mailbird support Hotmail email Sync ? Hey guys, for those of you who are wondering, this is a re-post, greatly improved of our old Multi-Identities blog post. I’ll wait for true multi-account support. Multi-identities isn’t bad for some uses, but I don’t want to forward all of my email accounts to my Gmail account. It’ll just make my Gmail inbox that much more chaotic. You’re not alone, and we’ll be launching Multi-Account in under a month. Any timeline update on multi-account? I check back every few months in hopes that I can switch over to MailBird. If you add fastmail.fm then i promise, i will buy pro! Fastmail accounts should work with Multi-Identities. If not, can you send an email to [email protected] to tell them about it? They’ll help you set it up. Does this mean others can mimic our mail ids using mail bird? Like send an email as if its being send from my mail id? Yes, they can. The same as well for other mail clients. Szymon’s got it. I could send an email from Bill Gates address right now if I wanted to, but it would say ‘send from ‘[email protected]”. But, if you want to set yours up so that it doesn’t say that, just check the SMTP box when you’re setting up your identity. Will it also support Exchange Accounts ? I believe so, yes. But let me double check that. Its been over two years, got any updates on this? When i use my company email for multi-identities ,it always says test error,and the mail server and port are right. Odd… I’m not sure your email or info, so I can’t help you from here….but email [email protected] and they’ll help you get it set up. it’s 30/5 today,will you release muti-account on Children’s Day? wow, awesome blog article.Really looking forward to read more. Awesome…. Still waiting for multi-account……….. for now I’ve been using Postbox because I have 4 accounts to manage. Can’t wait to switch to Mailbird for good. Hey Charnita, I can’t wait either xD. We’ll be testing it in the Alpha in about half a week. After that, if all goes well, you’ll have in in the beta within 4 weeks. Sorry for the hold up. This turned out to be a significantly bigger project than we anticipated. Era bueno hasta que vi que no podía tener múltiples cuentas. Es bueno espero y lo mejoren. Es probable que en un futuro lo compre. Hola Edwin, estamos trabajando en ello ahora. Será a cabo, con suerte, dentro de las próximas cuatro semanas. 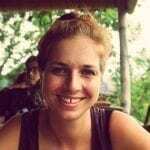 Mientras tanto, usted todavía puede tener todas tus cuentas en una bandeja de entrada con múltiples identidades y los pasos que hemos tratado en este post. Hey Frippe, yup. We’ll be testing it in the beta in about half a week. If all goes well, you’ll have it in the alpha within 4 weeks. sooo it’s been 2 months now…something has gone terribly wrong i guess? It’s turned out to be a much harrier challenge than we expected. It will be out in full in late fall. Hey Zouxc, it’s turned out to be a larger project than we anticipated, and we’ve been held back a bit while fixing some other beta problems that came up. We’ve cleared most of that up now though, and we’ll be testing it live in the Alpha soon. If all goes to plan, you’ll have it in the beta within 4 weeks. Support for multiple accounts has existed since longer than many people here have been using computers, I suspect. Example: Eudora added this feature in the 1990s. The fact you are crowbarring it in it at such a late stage of development makes me doubt how long you’ve tested it, and worry that it won’t work as expected; the fact you didn’t deem it a useful feature in the first place makes me wonder what else you may or may not have skipped. Like a lot of people I’m borderline desperate to move away from Outlook, and this sort of thing just drains me of all confidence. I’ll be sure to try Mailbird but my expectations are not high. Of course multi-account is important. That’s why it’s the main thing we’re working on. 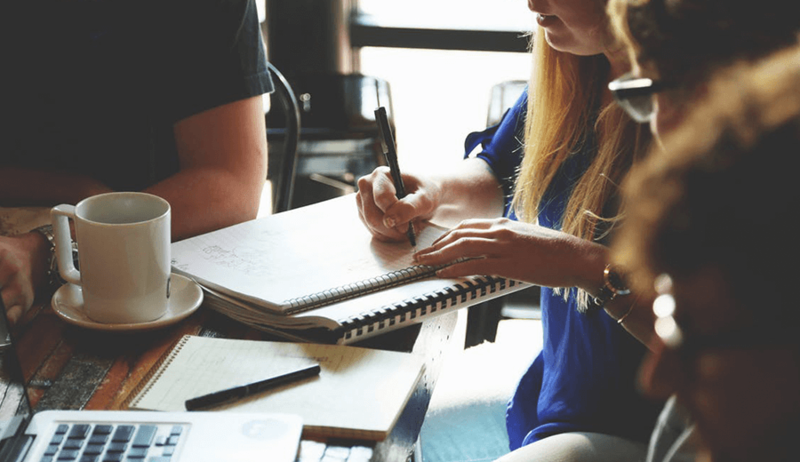 The issue is, it’s a quite complicated process to get an email client to work with all email providers…they all need to be configured differently. We didn’t ‘skip’ multi-account. We released out beta (side note: Mailbird is still in beta), before we had it so that you could start using it and saving time. Hang tight mate. If you need multi-account to move away from Outlook, we’ll have it soon. This post actually got me to change my email routing from multi-account to multi-identity but then i ended up using another client after anyway for google contacts editing. 🙁 I love the mailbird interface but i’m stuck on eM Client until that’s added. Hey odirex, thanks for taking the time to give it a shot. We’re working on google contacts now, though it’ll go live after multi-account. If you wanna be sure not to miss out, you can sign up to the email updates via the home page. On it. It’s a lot more complex than we expected. do you have a date of release of the version multi account? Hey Pillou69, should be out late fall. still no multi account . its 1 week into sept . any ideas when to expect .. i have not even got to use the program since i have no gmail account or desire to open one . I haven’t used Mail Bird because it doesn’t support multi-account even though I purchased the pro version already. IMAP will be live in about 3 weeks. Multi-account will be live in late fall. Hey GUYS – its October – when is multi account coming?!? Such a nice application for email, can’t wait to buy when multi-account arrives – a deal breaker at the moment. Good luck to the team, go go multi-accounts! I set up multi-identities and Mailbird receives copies of emails but they appear in the all mail folder and not the inbox. I need to have the forwarded emails appear in the inbox….I must be doing something wrong. If your account is Gmail, is it possible you have a filter/rule set up in Gmail to skip the inbox for messages coming from that identity? Once that is done…please try to add cross platform chat support for free.. I support fully on your project,,,if i was earning I would have donated a lot of money to you for this…PLEASE please please please make multi account free..
for a paid option? There are so many options out there that I’m compltely confused ..
For those of you still waiting for multi-accounts, you might also be interested in our free spam-prevention service, which gives you unlimited addresses that forward simply mail to your inbox. It’s not the same as MailBird, in that you cannot reply from these forwarders, but you can use them when signing-up for online services to protect your email address from spam, viruses, and other malware. 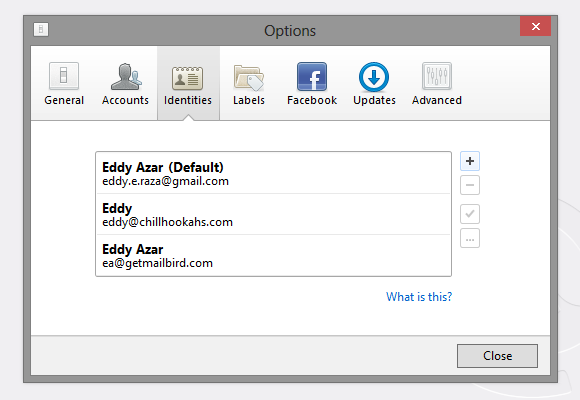 The best part is that you don’t have to switch identities or log-in to any other inbox, you just check your own mail. 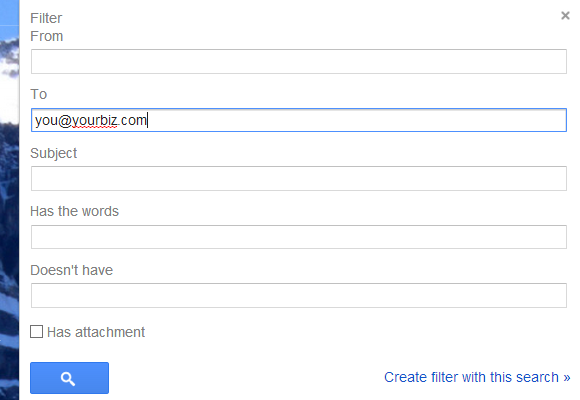 And if somehow spam slips through, click the button at the top of every email to Block Address or Block Domain.